My Garage is more of an extended living room of our home. We host several very large parties a year and need the extra space to of the garage to hold all the people. Comes in especially handy if it rains during an event. I have a old Sony stereo system rocking the tunes and several tables I can setup for dining or poker tournaments. The floor is covered with 8 year old RaceDeck snap together flooring that I find is super easy to keep clean. In the one corner is Harley Davidson Pub table and I have Gladiator GarageWorks cabinets for storage. on the bottom. We simply crank it up out of the way when not in use (most of the time). I really don’t have 1 theme for my garage, it’s all stuff I picked up over the years that I liked. Another cool feature is my nostalgic gas pump that has a 15″ TV/DVD player inside. by: Scotty Why yes, the workbench is made by Gladiator GarageWorks and it is very sturdy with adjustable feet. The butcher block top is super heavy duty and makes the perfect work surface. I highly recommend these Gladiator Workbenches. Mine is now over 10 years old and still looks and works perfect for my garage needs! 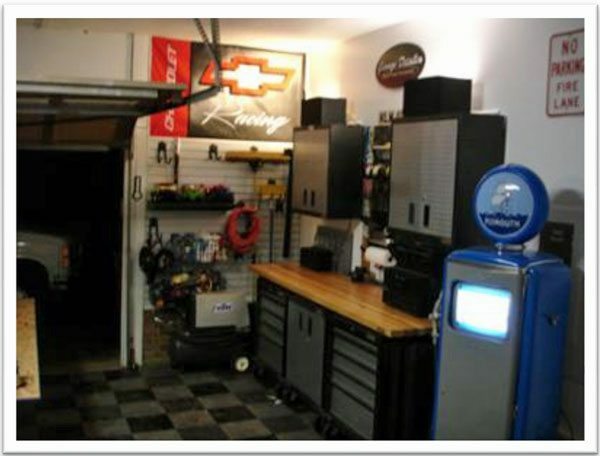 by: Tom K Hey I really like your garage. The work bench looks real sturdy. Is that Gladiator Garageworks too?